Is your internet service provider (ISP) delivering the speeds you’re paying for? Most people know what internet speeds they’re supposed to receive, but do you know whether you’re actually operating at those speeds? While there are some other factors, like the quality of your equipment, the most important aspect of your internet speed is your ISP’s ability to consistently provide you with reliable service. To test whether your service provider is living up to their end of the bargain, you can run internet speed tests, like the one offered by AT&T. There are many high-quality speed test tools available online, so let’s take a close look at the AT&T speed test to see if it’s a reliable application. Our goal with this review is to determine how accurate and consistent the AT&T internet speed test is, by focusing on its measurements of download and upload speeds, as well as ping or latency. To create a reliable testing environment, we run a series of five speed tests in one physical location. We use multiple devices to ensure there is as little hardware-related noise in our results as possible, and we run the tests on Google Chrome with no active plugins, and no other programs open. To run the AT&T speed test, we used a connection that delivers download speeds of up to 250 Mbps. As you can see in the table above, our results did not come close to our expectations. We also checked these results against those from other speed tests on the same connection, which usually register in the 200 Mbps range. Other issues with the testing process included the inconsistency of AT&T’s results regarding download speeds, and the fact that they do not list latency times on their mobile site (tests 4 and 5). On average, the tests recorded download speeds of 105.0 Mbps, and the test took around 42.8 seconds to run. Check out these screenshots, showing how the test functions on a laptop computer and a smartphone. One advantage of the AT&T internet speed test is how quickly the test loads. Whereas many competitors’ tests take a few extra seconds to be ready to run, in our experience AT&T’s tool is ready in less than two seconds. They also provide download estimates for MP3 files and video clips, and upload estimates for email attachments and photo galleries. This is a feature that’s exclusive to AT&T. 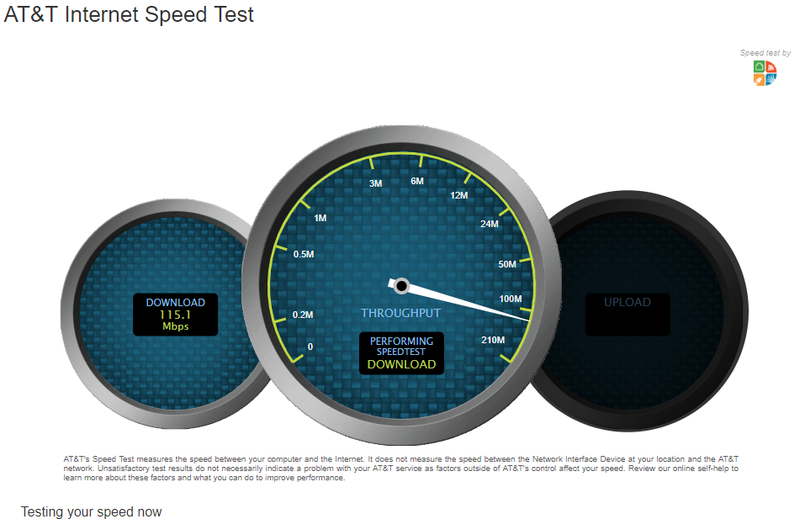 Unfortunately, there are many serious issues with the AT&T speed test. First and foremost, the results vary so widely that it’s hard to have any confidence in the tool’s accuracy. Our results from AT&T were much slower than any other speed test, and the download speeds varied by 70+ Mbps from test to test. Another problem is that AT&T doesn’t tell users where their testing location is ― for all we know, the server could be right down the street or 1,000 miles away. There’s also no information provided about your connection ― they don’t list your IP address or any info regarding your ISP. Furthermore, they don’t even provide ping/latency results on mobile devices, as latency is only listed on their full desktop site. Finally, we have some issues with the test’s interface. 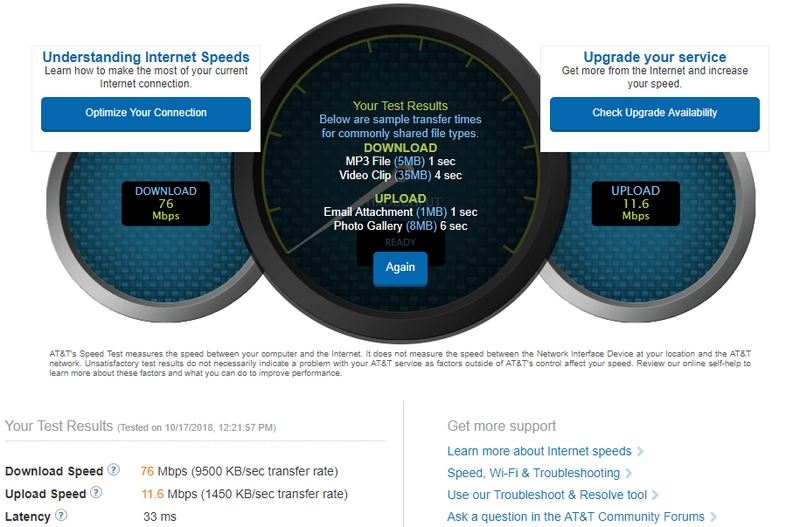 While it loads quickly, the AT&T internet speed test takes a long time to run. At 42.8 seconds, their test takes about 10 seconds longer than most competing tools. Also, despite the fact that the results screen lacks some important information, it still looks cluttered and poorly designed, with a too-busy aesthetic that isn’t pleasant to look at. All told, the AT&T speed test leaves much to be desired. It does get some things right, like the quick load time and the download/upload estimates for certain file types. However, their advantages are outweighed by a multitude of major problems. The test results vary considerably, and there’s crucial information missing regarding testing location, IP address, and internet service provider (ISP). In addition, the mobile version doesn’t show latency times, and the graphic design feels awkward and outdated. Overall, the AT&T internet speed test comes up far too short in many crucial areas.